Arnold Wanker has graced this web site in such encounters as THERE IS NO JOY, YOU ARE SLOWING DOWN OUR SERVICE and MOONSHINE OVER METHLAND. Arnold also has a close working relationship with Dr. Sweeney Todd (board-certified scambaiter), of YOUR UTTERANCE IS REPREHENSIBLE, DEMON SCAMBAITER OF FLEET STREET and INFORMED CONSENT. Here he faces off against Mrs Dora Lee, a loan officer and Mr. Lucas Kayleigh, "International Transfer Manager", Royal Bank of Scotland (whatever). Credit is tight, and Arnold lives from paycheck to paycheck, so when a banker contacts him out of the blue with a loan offer, he jumps on it. doracompany.com is a web site, hosted in Turkey. Seems like a legitimate Turkish company. Their mail server reports that the doraloan@doracompany.com account does not exist. "Mrs Dora Lee" asks for a reply to a hotmail account, counting on the potential victim not to contact the actual Dora Company. This looks like the same 'format' (as the scammers call it) as that featured in THE LOAN RANGER, a Raynaz adventure from August 2008. This is to certify that the management of the above named loan company has decided to grant you your loan request of $3,000.00 after a brief discussion with our loan officers and board of directors. We can grant you that amount of loan on one condition; we need your trust and co-operation. Rebuilding Society, itself a mutual not-for-private-profit social enterprise was established with the commercial objective of becoming a permanent and sustainable institution supporting the growing social enterprise sector. In order to achieve this we set our fees, interest rates and terms and conditions to cover our costs and protect our funds against losses. The interest rate, arrangement fee, terms and conditions are set separately for each loan. These notes are intended only as a guide for enquirers and form no part of any contract, agreement or offer. The term of the loan will depend upon the needs of the business, but will not normally be less than six months or more than fifty years. Note: A scan copy of your international/national identity card or a driver license will be send along with this mail for documentation of your loan process. For the expedite and a step forward in this transaction you are expected to get to me ASAP. The loan must refunded back to the lender at the end of the tenure the loan seeker is seeking the loan for without any delay. For this reason, we are giving a maximum duration of (1) Years to the loan seeker so that he /she will be able to repay the loan within that period. You are to note that repayment starts (6) months after receiving the loan. And you are required to make a Monthly repayment this is done because we do not want a situation whereby you are not able to meet up with the Yearly payment. We will provide you our account which you will be making the monthly installment after (6months of receiving the loan. NOTE THAT REPAYMENT STARTS (6) MONTHS AFTER RECEIVING THE LOAN AND YOU WILL HAVE TO MAKE REPAYMENT ONCE EVERY MONTH FOR GOOD (1Years) AND THE FIRST REPAYMENT WILL START AFTER 6 MONTHS. NOTE THAT YOU ARE REQUIRED TO GET BACK TO US AND LET US KNOW IF THE LOAN TERMS AND CONDITIONS ARE ACCEPTABLE TO YOU SO THAT WE CAN PROCEED TO THE NEXT STEP FOR THE LOAN. We will not normally ask for personal guarantees on loans from the Social Enterprise Funds, but may require them for the ABLE Funds. We will like to secure our loan against any assets of the organization where possible. Lack of sufficient security will not necessarily prevent the approval of a loan. It is a condition of all loans that borrowers co-operate in our regular monitoring, have proper financial systems, and provide quarterly management accounts which the bank will be transferring the loan into. If you are in agreement to the company terms and condition you are then advice to get back to me as soon as possible so that we can move to the next step. Note: Your cell phone number must be reachable at all time because without that we can not grant you this loan. You are to send us an email as soon as possible stating if you are in agreement with the terms okay. The acute reader will understand that the terms of the 'contract' are immaterial, as this is a scam. There is no loan forthcoming, although there will be processing fees or some such. If this is not clear, please print the main page of this web site in a large font, and place the print-out beside your bed for easy reference. Cool deal. So I get to keep the mony for a whole year? Thats awesome. I figure if I invest it in somethin thats a dead cert like my cousins weed bisiness Im sure to come out ahead. I dont have no drivin licens no more after I hit that fire hidrant last month. 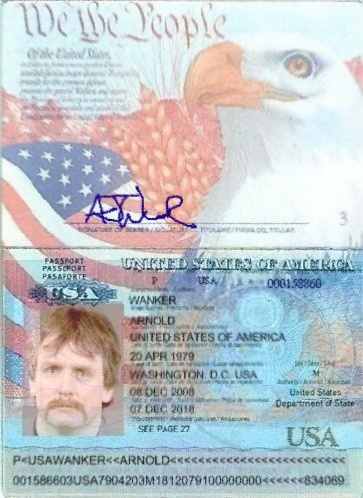 Heres a copy of my passport tho, hope thats OK. So are you goin to send me cash or a check? Thanks for the mail. We want you to know that this a legitimate loan company who can help you with the loan amount you need, now you have be a kind person and well honest and we see to be honest with you. we are fidelity we do keep our word and treat client with the best of our service. here is the option we do transfer funds, you are to fill this and let's move further okay. Bank To Bank Transfer: Here you are to send down your banking information�s so that we can forward it to the transfer department and then they will have to transfer your loan amount into your bank account .it will take 2 to 3 days to get this done. The transfer of the loan must be a bank to bank transfer, except otherwise stated by our company management or the borrower, so with this you are then advice to provide your full banking information for the transfer in your next mail. Good deal. Heres all the info and everythin yall need. Thanks for the mail. I have received your banking details and it has been forwarded to the transfer department they will send you a response as soon as possible okay. Thanks and i ant you to get back to me as soon as the bank send you a message. Per standard Lad SOP, enter the bank! THE ROYAL BANK AGENCY rotating globe. Formal Bank letter on a Bank Letterhead with logo as below will be needed. We just received a message from the Transferring Agent about the update on your transfer status,they said a problem occurs when they wanted to transfer your loan funds to your account he said he has verified your account and it was valid but a problem occurred when they wanted to wire the loan funds to your account. Your Loan Transfer Agent said your account don't have international business permit so it can not be used for any external transfers it can only be used for transfer of fund within your country.He further said that your account needs to be activated before the loan funds can reflect in your account. Meanwhile we have updated your loan lender on the latest development on your loan transfer status,you are needed to provide the sum of $315 USD for your account activation and as soon as this fee is provided for your account activation, your loan funds will reflect in your account your account without any delay and as you can see in your loan transfer status it is 95% now and as soon as the account is been activated the remaining 5% will be completed. And after your account has been activated the account will be ready for use any time. The account only needs to be activated once after this the account will no longer be activated and it will be set for external transfers any time okay. I want you to get back to us, so i can direct you on how you are to transfer the fee for your account activation. I await your mail soon, your loan funds has been approved by your lender of $3,000.00 USD today. Thank you for using ROYAL bank pl c online for transferring your funds. However, we are here to give you the very best services as a bank... As a co-operative institution with a rich history of focusing on customers, ROYAL Bank consistently pushes the boundaries of traditional personal banking. FUND OF $3,000.00 USD TO BE REFLECTED IN YOUR BANK ACCOUNT. Enjoy better online banking with ROYAL BANK !!!!!!! Arnold doesn't have a lot of cash lying around, so he makes a simple request. I got a mesage back from the transfer department. Trouble is they want $315 for some permit thingy before they can transfer mony into my account. If I had $315 to spare, I woudlnt need to ask yall for the loan in the first place. Can you take $315 out of the loan so they can get the permit sorted? ... which sparks a long, defensive and deeply religious response, with a dash of gender confusion. Should be read out loud for maximum effect. I am in receipt of your mail and i appreciate your incentive response but do not compare me with other Lenders, I am different from them entirely. It is quite unfortunate that most people are ignorant about the fact that out of every 12, there must be a Judah. There is no country without bad people but that does not mean that every one in that country is bad. No, there are still some good one. By my age i cannot still be a party to any scam activity, besides i am a Christian and such practices are against my religion. Take my word. try as much as possible to come up with the fee, i assure you immediately you make the payment the loan will be transferred to you instantly, and this is what will be transferred to your personal via western union, This what you now be getting as loan. so that it can carry this transfer immediately, as soon as i receive the fee. Just believe that the fee is a challenge to you, if you have that believe then you will receive this loan soonest. The ultimate measure of a woman or man is not where she stands in moments of comfort, but where she stands at times of challenge and controversy. Setting a goal is not the main thing, it is deciding on how you will go about achieving it and staying with that plan. You have already receive this loan, the fee for transferred to is what is holding down this transaction. Also before we started this transaction, i told you that i don't want any party of scammers so i strongly believe that you are not a scam that is why i want to make business with you, so if you really need this loan just mail back so that we can proceed. I know how things are with you right now. It is a general phenomenon. I am only just advising you like a blood, I will be the happiest man on earth after this fund must have been transferred to you. There is no secret to success, it is the result of preparation, hard work. Please try to come up with this form so that we can make each other happy. This is an opportunity I won't allow you to miss. If you should miss this, it then obviously means that I don't love your progress. I know how you feel right now, but feel free because you will soon receive this loan. The fee for transferred of your loan to you. Is very compulsory. The great opportunity in your life is where you are right now. Every situation, properly perceived, becomes an opportunity for you. You have grand opportunities all round you. Open your eyes, and you will find it. Just believe that you have already receive this loan. Motivation is very important, but it is determination that will make you cross the highest mountain and most difficult river. Regards on your kind understanding, trust and co-operation in regards to this transaction. I am indeed grateful. Hope to see your name in our monthly install-mental payer's list soonest. Im real glad to hear your a Christain and everythin. I have to admit Ive not been real good at getting to church regular lately, but Im still spiritial and believin in God and Jesus and stuff. Also I have to say I aint real good with book learnin, so yall are gonna have to remind me who Judah is. Is he the dude that done got ate by that bigass whale? I remember in Sunday school hearin somethin about that, but all the boys in the class got distracted cuz the Sunday school teacher used to wear these low cut blouses, and you used to be able to see down them and get a good view of her sweater puppies iffen you got the right angle. So given your religius I know you aint no scammer or nothin, its just that Im really hurtin for money right now which is why I turned to you for the loan in the first place. You must have a whole bunch of mony in hand if your out there lendin it to all these people and companies and such. Becuase were both Christains and all, could you find it in your heart to lend me the mony so I can get the loan set up? Otherwise Im gonna have to do somethin that aint right with God, like puttin oregano in the weed Im sellin for my cousin, to get the mony together. I UNDERSTAND DO MORE OK TRY TO GET THIS MONEY IS NOT TO HUGE YOUR LOAN IS IN PROCESS LET GET THIS DONE WANKER, ALL BECAUSE I PUT TRUST IN YOU THAT WHY I TOLD THE BANK TO CARRY ON THE PROCESS SO YOU WANNA MAKE ME UNGRATEFUL PERSON TRY AND UNDERSTAND ME, YOU WILL GET YOUR LOAN ONCE YOU SEND THE PAYMENT OKAY. I want you to know that my coming into lending is for the benefit of financially less privileged and not to rip people of their hard earned money. I don't know how to explain this to you but you make me think i should stop this transaction but i can see it in your face that you need this loan for real and i am ready to do all possible best to make sure you get this loan. . I am not taking your money,as the fee that you are paying is an evidence that you loaned from my company God knows i was surprised to receive such email from you . This is an international business loan transaction, it is been full of doubts and mis trustfulness. I am a Christian, so I believe you are too . I understand that you are trying to protect your self from been scammed. But this is quite unfortunate that you are ignorant about the fact that out of 12 there must be a Judas. it then means that you will receive this loan. The ultimate measure of a man is not where he lies in times of comfort, but where he stands in times of controversy and pressure. I understand your fears as some set of people have decided to disguise as lenders but at the end they are scams.I want you to know that in the midst of scams there are still genuine lenders who do not rip individuals of their hard earned money. I am not after any clients money and will do nothing of that sort because as a devout and practicing Christian ,i believe in the law of karma and the golden rule which urges us not to hurt our neighbors so if you think i will deviate from my principles ,that is a big mistake. I have feelings for people all over the world especially the ones that are not financially stable, this is due to the fact that i have been like that before and during the period that i was in that state, nobody treated me wrongly so treating somebody that need help wrongly is wickedness of which i am not a party too. Give us a try as there is no financial mountain that is insurmountable as the only thing needed is your climbing faith,Trust me and you will never be disappointed. Like I done told you last time, it aint that Im acusing you of bein no scammer or nothin. You told me your a Christain, and thats good enuf for me to trust that you aint out there ripin people off. All Im sayin is, as one Christain to another, cant you see fit to help me out and lend me the $315 I need to get the loan transfered? I swear to God that Ill put in extra hours at the retread factory and pay you the $315 back. And you know you can trust be cuz like I said Im a Christain as well so I aint lyin to you. Its kinda like that time when Jesus was in the dessert and it was real hot and then Satan showed up. So I bet if Jesus had asked you for the $315 so that he didnt have to borow nothin from Satan youd help him out, right? So its the same thing, if you help me out, I aint gonna need to do anythin that aint right to get the money. Now the scammer gets tough. THANKS FOR THE MAIL. I WANT YOU TO KNOW THAT I CAN'T PAY IT FOR YOU WE DONT DO THAT HERE IN MY COMPANY SO IF YOU ARE 100% SERIOUS ABOUT THIS AND YOU WANT TO GET IT DONE GO OUT THERE AND FIND WHO TO BORROW YOU THIS FEE AND SEND IT TO THE BANK SO THAT THEY CAN ACTIVATE YOUR ACCOUNT. Im sad to hear yall cant help me out, specialy given that both of us are felow Christains and all. Still I know with my faith and all theres goin to be a way we can make this work. OK, so now Im gettin inspired... hows this for a deal? I got a bottle of Mylanta, half full, that I swear to God is the one they found in Elvis's bathroom on the day he died. Thats got to be worth $500 to $1K easily at auction, but its yours if youll pay the transfer fee. Just tell me your addy and Ill put it right in the mail to you. So I done came up with the $315. Between you and me, cuz you aint showin me no Christain charity, I had to raise most of the mony by sellin some mushrooms I took off this pizza thats been in my fridge about a month to this high school kid who thought theyd get him high. I aint feelin real good about it with God, plus theres gonna be an asskickin comin my way from the kid and his buddies iffen he gets sick. Anyhow, do yall still have the loan? Where do I send he mony? Thanks for the mail. I really appreciate your good response and i want you to know that as soon as this is done you will have your money transferred without no further delay. 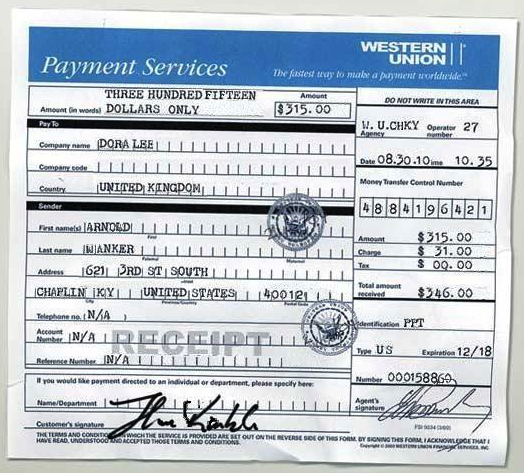 You are to send the payment via western union money transfer and make sure it done before leaving okay, here is the payment information you are to send the payment down. After the payment has been made you are to send the following details down. I also want you to know that as soon as we receive this information and the payment has been confirmed you will have your funds transferred directly to your Bank account okay. I will be waiting to hear from you as soon as possible. Thanks and Waiting on your email. Sounds like a good deal. If you can get the money in my bank sooner rather than later that would be good, cuz Im hearin that that kid I done sold the shrooms to got real sick. Word is he puked in his cousins new beemer, and his cousins an ex con that you dont want to mess with. So Im thinkin to take the $$$ and skip town for a while. Let me know as soon as the monys in my bank, cuz like I said Im plannin on takin some cash out and bailin soon as it comes thru. Thanks for the mail. I will get back to you as soon as the payment is confirmed okay, and i want you to know that the loan will be in your account as soon as possible thanks. Cool deal. Like I said, sooner rather than later is good, cuz Im gonna need to blow town for a while. Whats goin on with the transfer? I attached the slip like yall said. I need that mony in my bank fast. THANKS FOR THE MAIL. I WANT YOU TO KNOW THAT THE MTCN NUMBER WAS WRONG WHICH YOU SEND BEFORE INSTEAD OF 4884196421, YOU SENT 4884194621 THIS WAS WRONG. SO THE BANK WILL MAKE THE PICK UP AS SOON AS POSSIBLE AND GET BACK TO ME THEN I WILL LET YOU KNOW HOW TO RECEIVE YOUR FUNDS OKAY. SO PLEASE THE ERROR WAS FROM YOU BEFORE, SO I WANT YOU TO EXCISE PATIENT AND I WILL GET BACK AT YOU OK.
OK, my bad. Sorry about the mixup. I never have been much good with numbers and book lernin and such. Hope yall will be able to send the money soon. THANKS FOR THE MAIL. I WANT YOU TO KNOW THAT THE MONEY WAS NOT PAID IN THE WESTERN UNION OFFICE, THEY JUST COLLECT THE MONEY FROM YOU AND GIVE YOU THE DETAILS THE PAYMENT WAS NOT SEND. YOU ARE ADVICE TO OPEN WWW.WESTERNUNION.COM. AND GO TO TRACK THEN TRACK IT YOUR SELF AND SEE THAT THE PAYMENT WAS NOT SEND OUT. NIETHER IT WAS PICKED UP SO YOU ARE TO DO THIS TODAY AND MAKE SURE THE PAYMENT IS RESEND INSTANT AND THE TRANSFER WAS SENT OUT. YOU ARE TO GO BACK TO THE WETSERN UNION OFFICE AND COLLECT THE MONEY, THEN YOU RESEND IT AND MAKE SURE THE TRANSFER IS DONE BEFORE SEND ME ANY INFORMATION AND I ALSO WANT YOU TO TRACK IT ONLINE BEFORE YOU SEND IT TO ME JUST TO MAKE SURE IT THERE OKAY. I WILL WAIT TO HEAR FROM YOU WHEN THIS IS DONE, BECAUSE THIS IS THE LATEST PROBLEM THAT IS HOLDING YOUR FUNDS. SO DO IT AND HAVE IT AS SOON AS THE PAYMENT IS CONFIRMED OKAY. Real nice to hear from you again. So heres the thing... iffen your goin to track it online, then its no fun, becuase I dont get to send you down to the Western Union office one more time. Hows the weather over there in Lagos? I here theres some thunderstorms right now. We get those in summer in Kentucky also. So I learned a new word the other day. Mugu. You say it like moo-goo, right? Aint that the Nigerian way to say dumbass? Anyway, mugu, its been real fun wastin your time.